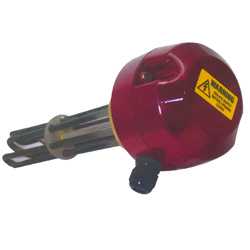 An electric immersion heater is a device which is installed in a tank or container to heat a liquid. The installation can be over-the-side, flanged or threaded. The unique advantage of electric heaters is that it can be applied effectively and economically almost everywhere thermal energy is required. Electric heat is neither limited or restricted by environmental considerations and is frequently the only solution to specific problem. There are three main types of submersible electric heaters: Over-the-side, flanges and screw plug heaters. The screw plug immersion heaters with single thread pipe construction is a compact device for with either 5/8", ¾" or 1¼" diameter 316 SS sheaths. These industrial heaters have a wattage of 400 to 1000 Watts. Screw plug immersion heaters can be applied to a variety of clean water and oil applications. The PTH Series consists of a heavy-duty, general purpose industrial heater for plating tanks, rinse tanks, and other tanks containing aqueous solutions. The 316 SS sheath is passivated, providing resistance to corrosion. These heaters elements are equipped with a vapor-tight terminal enclosure and a 3-foot-long, vinyl-covered flexible conduit containing the 2 power leads and a ground wire. The stainless steel mounting bracket can slide along the element, which makes installation easy. The CH-OTS electric heater series is a easy-to-use and simple-to-install portable tank heater. The heater consists of copper sheath Nickel plated elements, watt densities in the range of 40 to 50 W/in2, power ratings of 4 and 6 kW for 208 and 240 Volt. The main features of the industrial heater include a 26 inch riser (unheated section) and an integrated temperature control for the range of 60 to 250F. Over-the-side immersion heaters are designed for vessels where through the side submersible heaters cannot be conveniently installed. The best way to use these heaters is installing those through the top of the vessel with the heated portion of the unit along the side or at the bottom of the tank. Natural circulation of the fluid inside the tank allows for even distribution. Terminal houses or lead wires are provided for power connection. The immersion heater element is installed in the top of a tank with the heated portion directly immersed along the side or at the bottom. This provides easy removal of the heater and ample working space inside the tank. 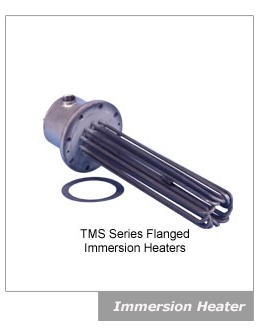 The large variation in inmmersion heating element material and shapes of over-the-side immersion heaters offers a wide selection in the application of these units. Water, oils, solvent, plating baths, salts and acids are some of the many liquids and viscous materials commonly heated with immersion heaters. Over-the-side types permit portability, easy removal for cleaning of tanks and heaters, and ample working area within the tank when installed. Flanged immersion heaters consist of hairpin bent tubular elements welded or brazed into a flange and provided with wiring boxes for electrical connections. 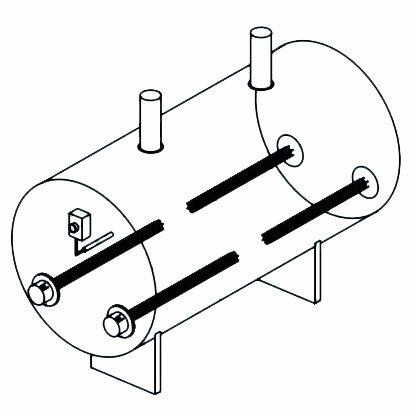 Flange heaters are installed by bolting to a matching flange welded to the tank wall or nozzle. A wide selection of flange sizes, wattages, voltages, terminal housings and sheath materials makes these heaters ideal for all types of heating applications. A thermostat protective well is standard on most models. This well is installed through the flange parallel with the heating elements This 1/2" thermowell is provided for accepting a temperature sensing probe for use with a thermostat or other type control system. Flexibility of the type of control can be provided to give exact process control precision to match your process needs. These electric immersion heaters utilize standard pipe flanges ranging from 3" to 14" in diameter to support high tank pressures of liquids. They are installed through a matching companion flange, obtainable from local industrial supply houses, to the tank wall. A wide selection of watt densities, heating outputs and flange sizes and ratings make this an excellent heater for all tanks, vats or irregularly shaped vessels. This type of electric immersion heaters are used for heating liquids in a variety of processes. Those heaters are ideal for process water heating and freeze protection. All types of oils and heat transfer solutions can also be heated using these compact easily controlled units. 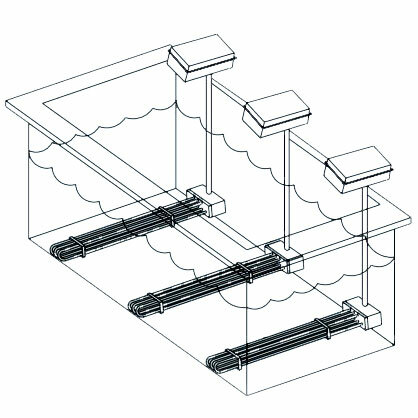 The direct immersion method is energy efficient and well suited for many applications. The heavy duty tubular elements are welded or brazed to a screw plug. 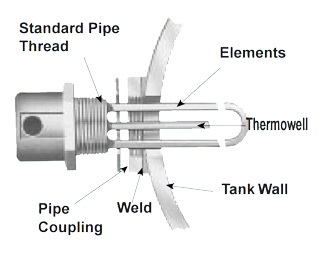 Uniform heat distribution and repressed element bends provide long element life.For heaters with built-in thermostats, a thermowell (hollow tube sealed at one end) is welded or brazed to the screw plug and allows thermostat sensing element replacement without draining the tank. Screw plug heaters are equipped with a steel enclosure, and are also available with a combination moisture resistant/explosion resistant enclosure. The heater element is screwed directly through a threaded opening in tank wall. Heavy tank walls may be drilled and tapped if thickness is sufficient to engage 3/4 of threads. Lighter tank walls should be equipped with suitable pipe halfcoupling attached with proper braze or weld material. Many screw plug and flanged type heaters are available with built-in thermostatic controls. In some installations, where there is more than one heater in a tank, you may consider one heater with a built-in control that will control the other heaters by wiring thermostat into the holding coil circuit of a magnetic contactor. If the thermostat is separate from the heater, the thermostat sensing element should be located approximately 4 to 6 inches above the heater. Other types of controls are available where a high degree of accuracy or a more versatile control scheme is required. Electronic controls and complete control panels are easily installed.